Also serving communities of Blacksburg, Fairlawn. There are 5 Memory Care Facilities in the Salem area, with 2 in Salem and 3 nearby. The average cost of memory care in Salem is $2,455 per month. This is lower than the national median of $4,650. To help you with your search, browse the 12 reviews below for memory care facilities in Salem. On average, consumers rate memory care in Salem 3.7 out of 5 stars. Salem is a small city of fewer than 26,000 people, nearly 19 percent of whom are seniors. It's situated in the southwestern region of Virginia, a state where 140,000 seniors have Alzheimer's disease. Families and seniors who have been affected by dementia receive support from the Local Office on Aging, as well as the Alzheimer's Association Central and Western Virginia Chapter. To accommodate the needs of seniors with dementia who are no longer able to live at home, the Salem area has five memory care facilities, with two in the city proper and three more in the nearby cities of Roanoke and Daleville. These facilities are officially called "special care units" and may either be freestanding or located within an assisted living facility. While Salem's cost of living is about 7 percent below the national average, healthcare expenses are about 4 percent higher here than they are in the nation as a whole. This may be a consideration for families whose senior loved one has a chronic condition like dementia. Crime rates in Salem are a little lower than the national average, which may appeal to families who are researching memory care facilities in southwest Virginia. On a 100-point scale, with a lower score representing lower crime, the city's violent crime rate is 30, compared to the national average of 31.1, and the property crime rate is 36.5, versus the national median of 38.1. Salem's climate is relatively pleasant throughout the year. On Sperling's Comfort Index, which evaluates cities based on their year-round temperatures and humidity levels, Salem is rated 70 out of 100, compared to the national average of 54. This city may be well-suited for seniors who enjoy relaxing outdoors. Seniors in Salem do not pay income tax on their Social Security benefits. While other types of retirement income are taxable, up to $12,000 is tax deductible. This may allow for more money in the memory care budget. Memory Care costs in Salem start around $2,455 per month on average, while the nationwide average cost of memory care is $4,799 per month. To see a list of free memory care resources in Salem, please visit our Assisted Living in Virginia page. 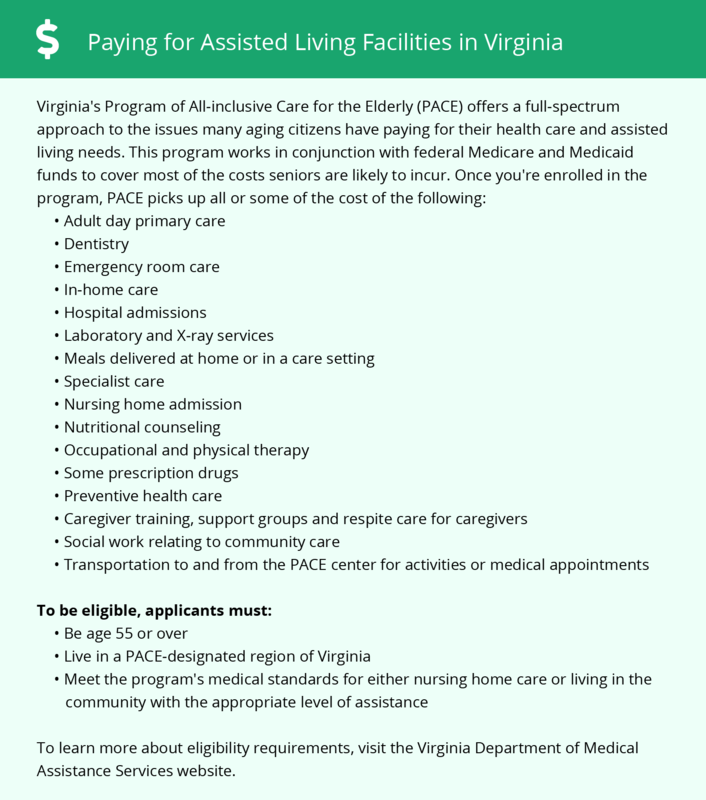 Salem-area assisted living communities must adhere to the comprehensive set of state laws and regulations that all assisted living communities in Virginia are required to follow. Visit our Memory Care in Virginia page for more information about these laws.